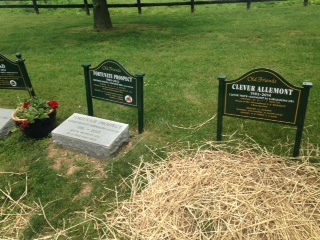 This year’s Memorial Day ceremony was a particularly wrenching one, as we lost some of the horses who bound us the most closely to Old Friends’ history, our “foundation stallions” Creator (1986-2015), Ogygian (1983-2015), and our long-time residents Kiri’s Clown (1989-2014) and Williamstown (1990-2015). 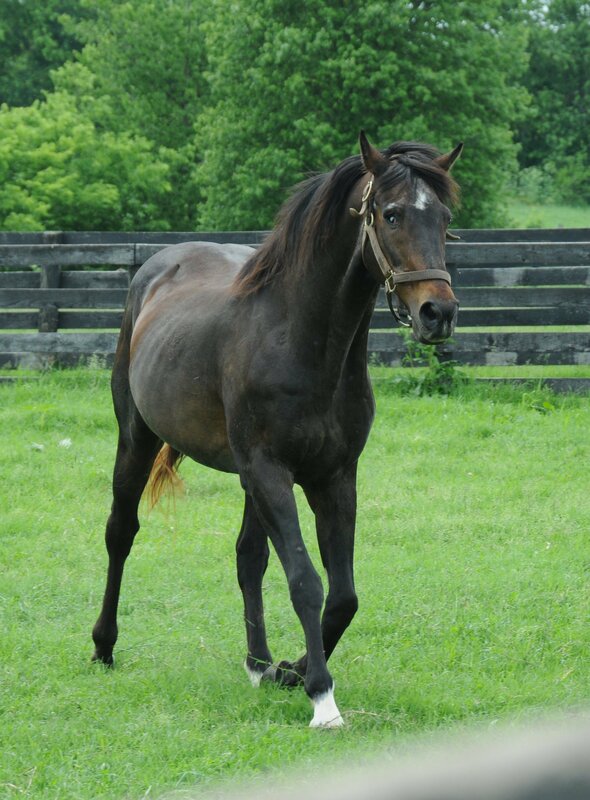 And the much-loved Clever Allemont (1982-2014), Prized (1986-2014), Ava Lotta Hope (1987-2014), and those who died all too young, A. P. Slew (1999-2014), Bluesthestandard (1997-2014), Max a Million (2000-2014), and Escapedfromnewyork (2005-2015). Though the forecast threatened rain, the grey clouds passed over without letting loose on the good-sized gathering who came to bid our much-missed friends goodbye. Memorial Day 2015. Photo by Diane White. 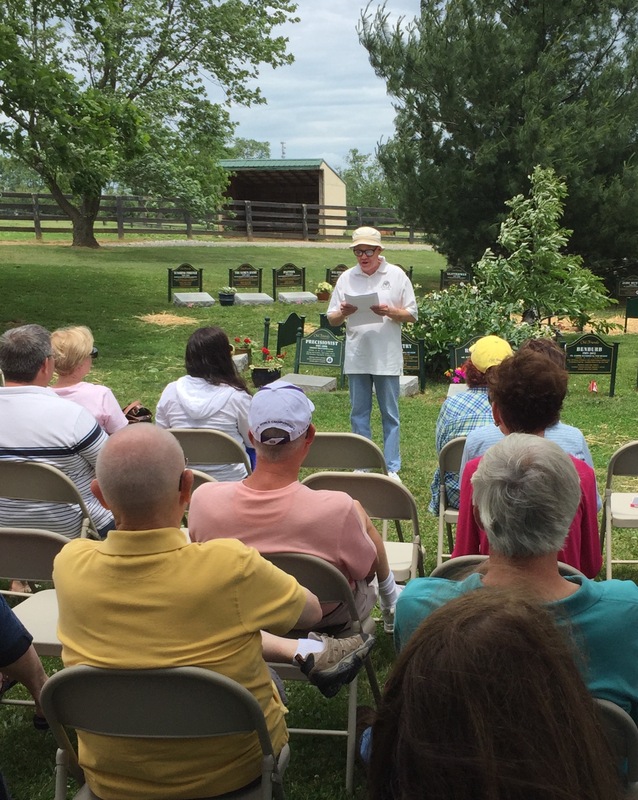 Bill Mooney, Old Friends’ official eulogist, delivered his knowledgeable and caring tribute to all of the horses who passed in the last year, collectively and one by one. 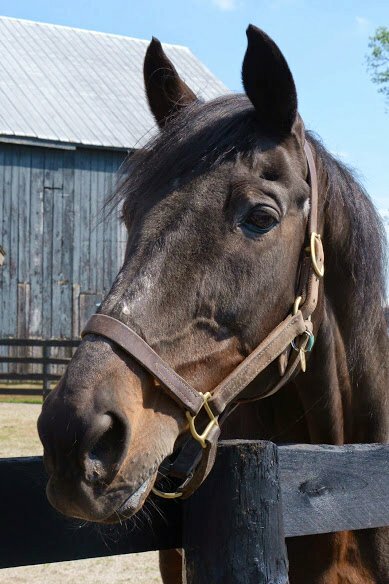 Then, following what has by now become an Old Friends tradition, each horse’s life was honored in words by those who had helped care for them, or knew them well, or remembered them with special admiration. 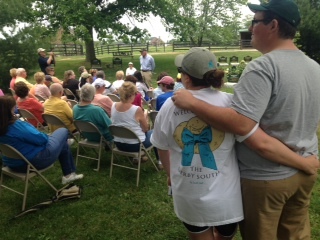 Volunteer John Bradley, a particular friend of Ava Lotta Hope in her last months, paid a tribute to Assistant Barn Manager Carole Oates’ loving care of Hope by presenting her with a halter he’d ordered that the mare never had the chance to wear. 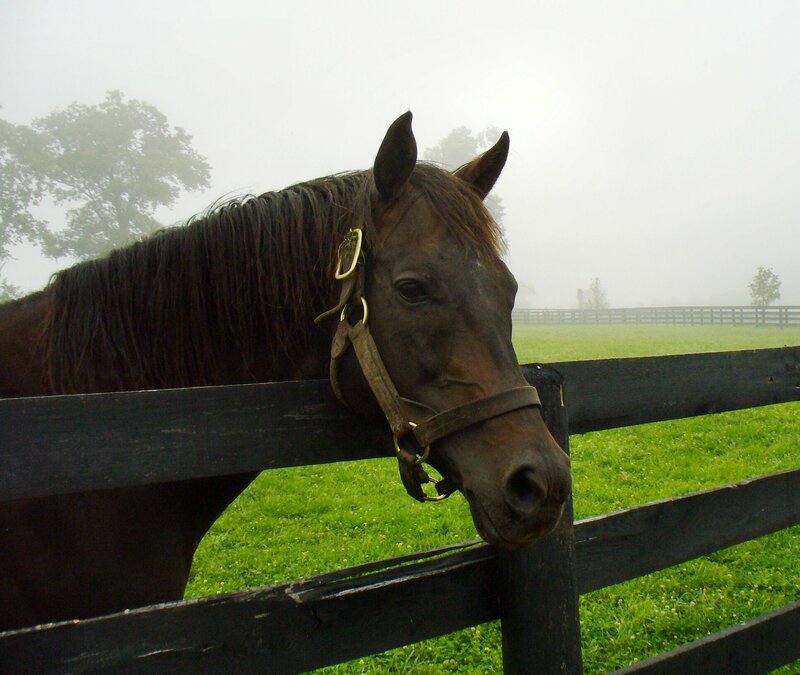 When Michael had spoken about the speedy and dignified Williamstown and asked if anyone had any words they wanted to add, none other than Peter Wilmott, Williamstown’s racing owner, stood from where he’d been sitting quietly in the gathering, and reminisced about the brilliant son of Seattle Slew. 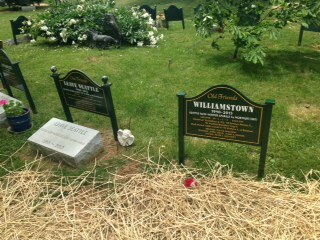 Peter Wilmott shares remembrances about Williamstown. Photo by Barbara. Volunteer Bea Snyder read a celebration of Creator’s greatness written by his pal Vivien Morrison, who was unable to attend due to a broken leg (and who was missed!). 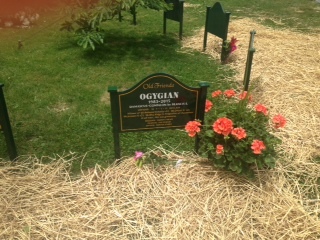 Several people had memories to share of Ogygian’s magnificence. I won’t say it was an easy day. But being among friends who understood the losses and feeling their support made it endurable. 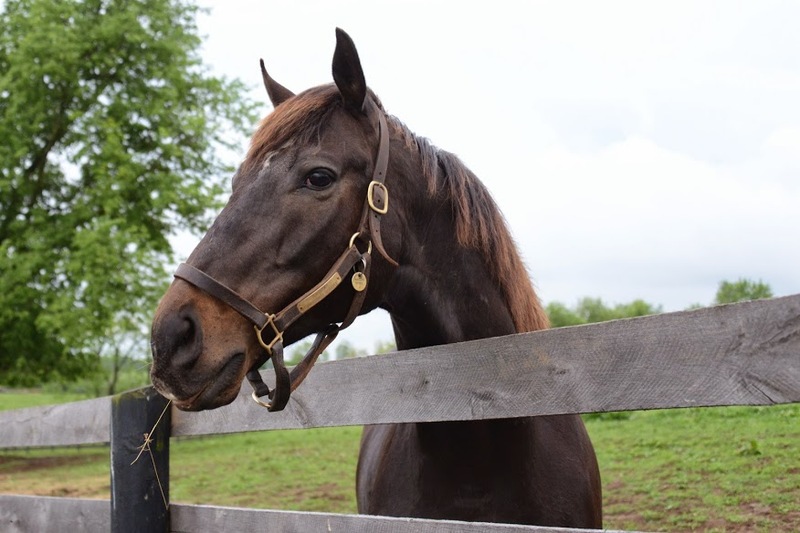 My only regret was that facilitating a request to see a living horse from a past connection of his prevented me from telling Mr. Wilmott what a good friend Williamstown was to me in so many ways over the years, and how much I miss him. 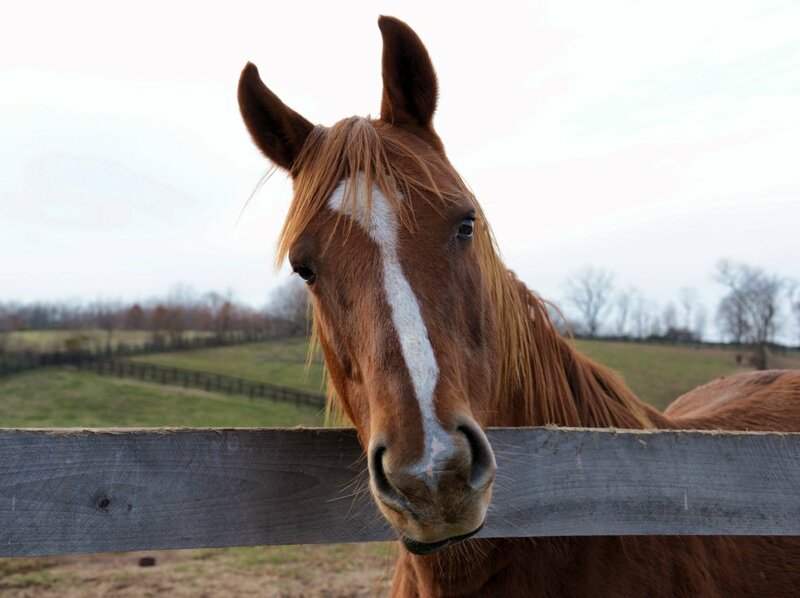 Though he was a self-sufficient horse and a tough one, he had his kind side and knew how to make and keep a bond. For me, the pain of losing Ogygian, and A. P. Slew who I’d always thought would be there to help me through losing Ogygian, is still too deep to express. 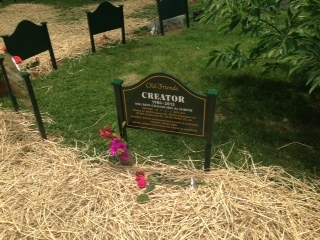 My gratitude to Michael for his worthy tribute to Ogygian when I couldn’t have gotten through giving him one he deserved, and Old Friends’ warm thanks go out to each and every one of you who have sent us comfort in so many ways for these losses. 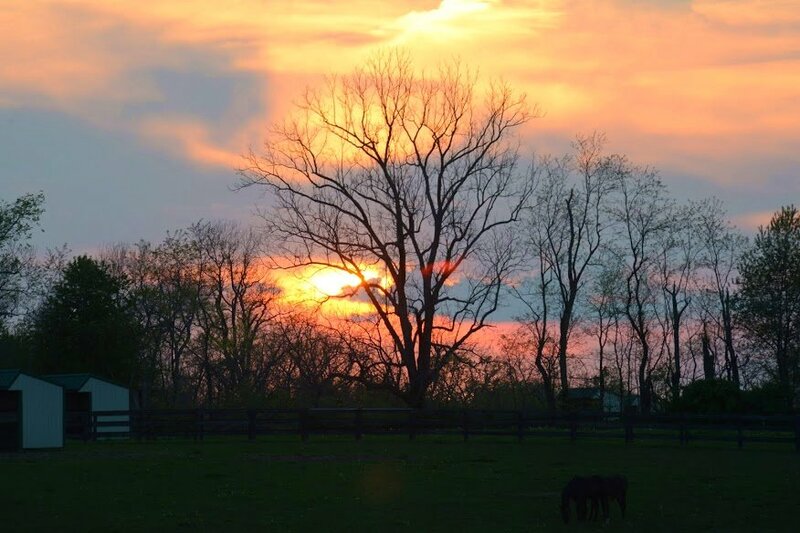 When sometimes we feel they are too deep to go on, it’s your caring that picks us up and puts us back on our feet–your kindness, and the kindness of the horses who grazed around us as we remembered those who’d passed, the living horses enjoying their retirement, all of them continually, every day, inspiring. Kiri’s Clown. Photo by Beth. Creator. Photo by Laura Battles. A. P. Slew. Photo by Laura. Ava Lotta Hope. Photo by Laura. Clever Allemont. Photo by Laura. Max a Million. Photo by Laura. Old Friends in Kentucky has had the biggest, busiest Keeneland and Derby seasons ever. We send a huge thank you to all who visited us this spring and we hope you’ll return soon. As a tour guide, I’ve never felt more proud of the residents I’m lucky to introduce to people. 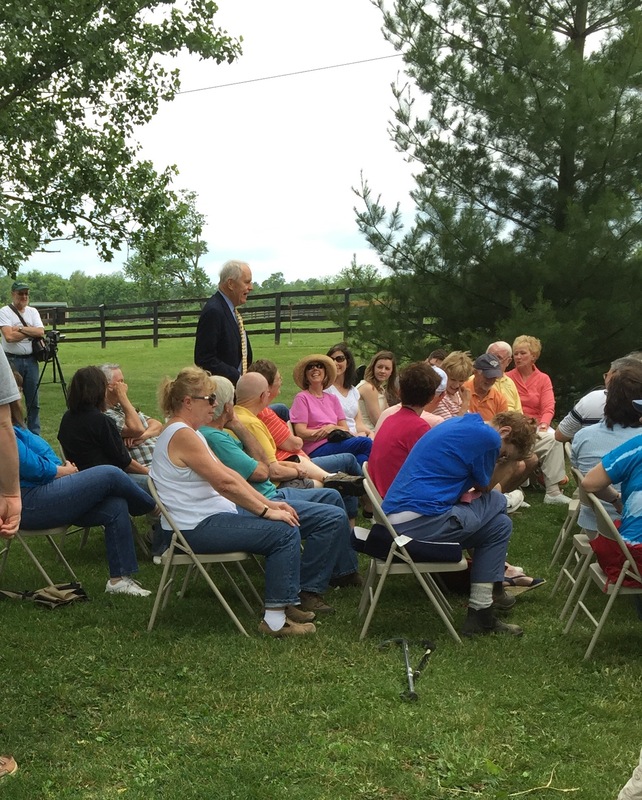 What a thrill it is to bring people to meet a Kentucky Derby winner. 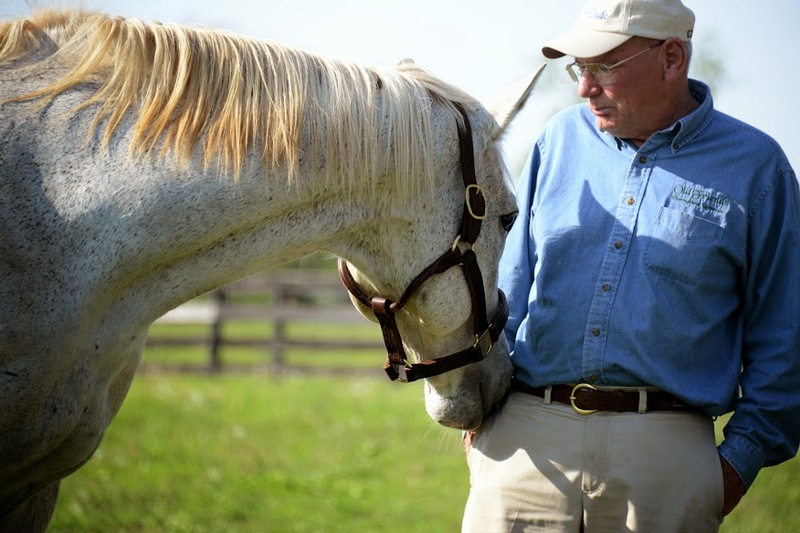 And not just any Kentucky Derby winner, the remarkable Silver Charm himself. But it’s not just superstars like Silver Charm, Game On Dude, Gulch and Commentator I’m so proud of. Commentator moseys over to say hi. Photo by Laura Battles. Here they come! Lusty Latin, Stormy Passage, Ukiah, Diamond Stripes, Ferocious Won. Photo by Laura. Greys on parade. Lusty Latin, Ukiah, Diamond Stripes. Photo by Laura. Everybody’s contented. 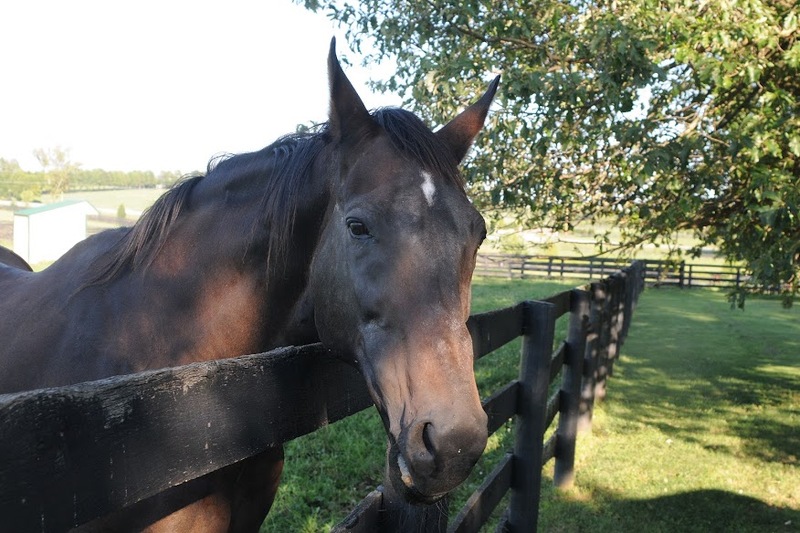 Old Friends has never been able to give a secure home and great care to as many horses. We couldn’t do it without you. And it couldn’t happen without the utter dedication of hard-working, knowledgeable farm manager Tim Wilson and his team. 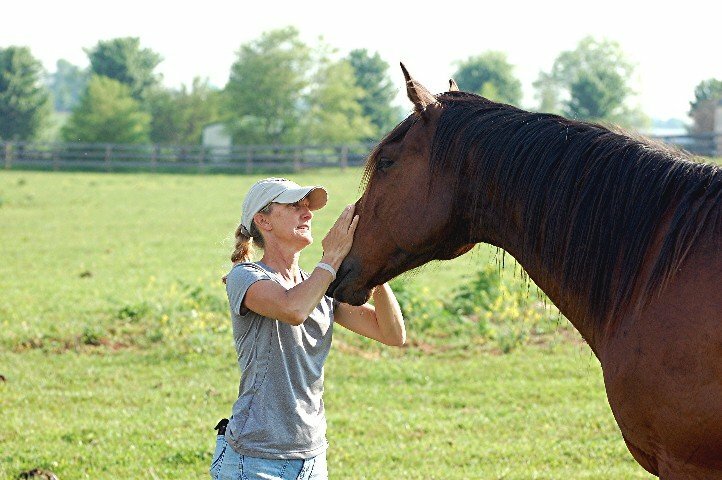 They’re all great, but I want to make special mention of assistant manager Carole Oates who does so much of the hands-on care, day in and day out, and knows each and every horse so well that she spots the slightest signs of any change in their demeanor. 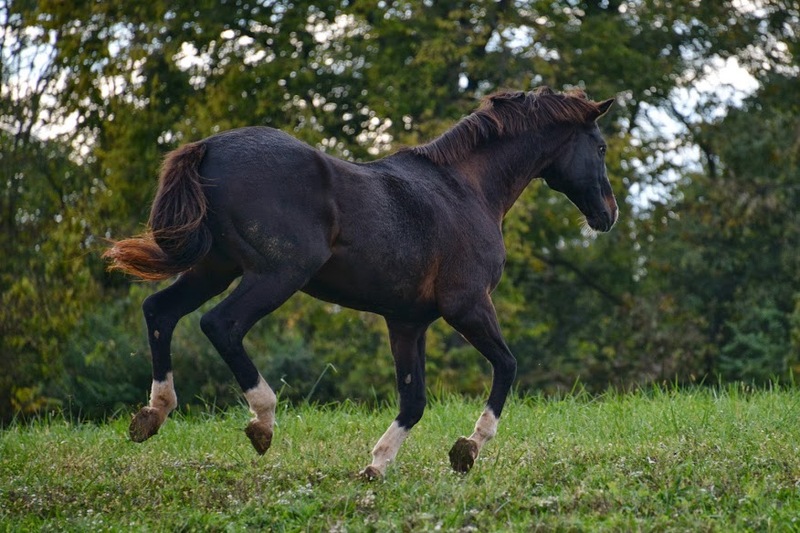 Carole’s horse intuition is as deep as her knowledge of horse care. Carole and Lion Hunter. Photo by Rick Capone. 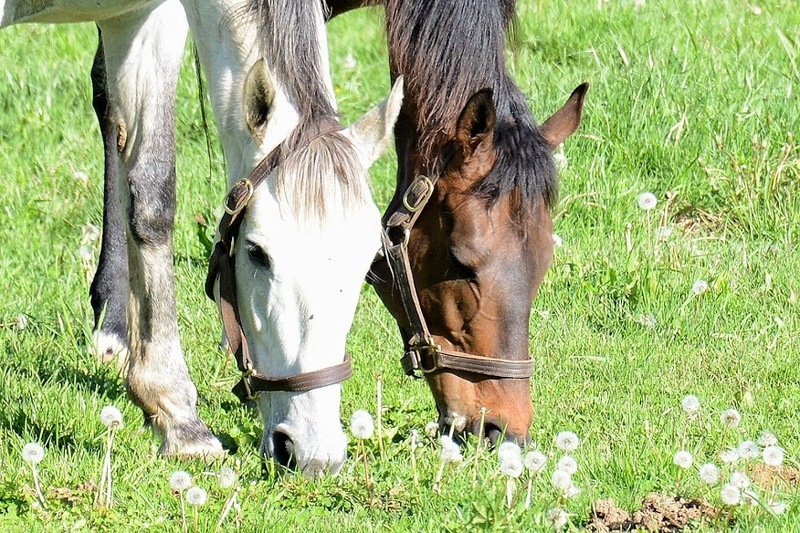 We’re now in one of my favorite times of the year, the lull between Derby season and vacation season, as summer comes on, and the horses feast on the richest grass of the year and relax in the warm sun. 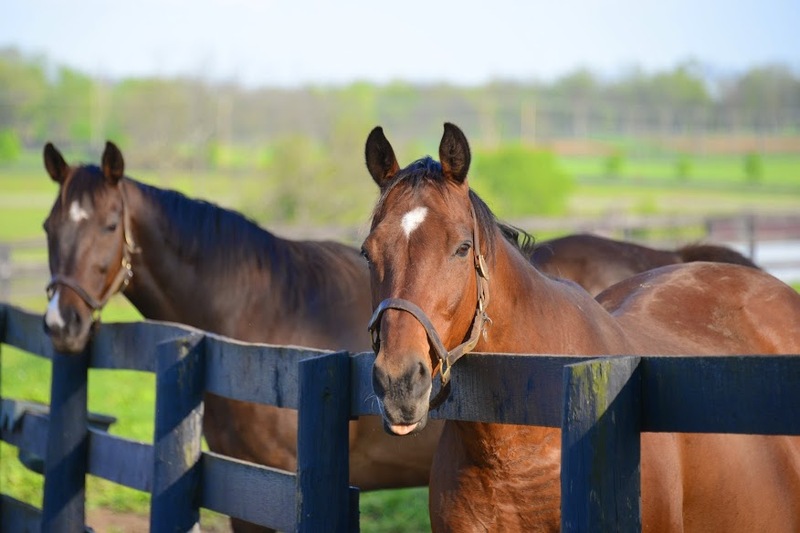 The stallions hang out in pairs and threes at their fences in neighboring paddocks. 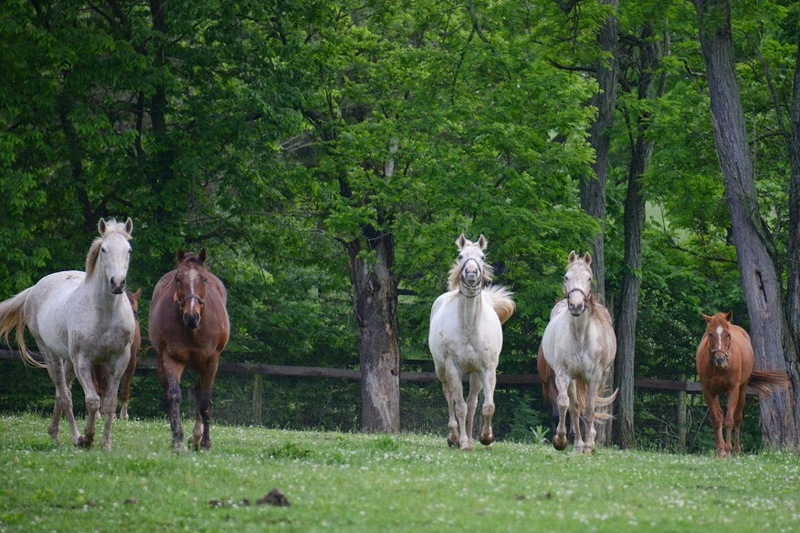 The mares and geldings enjoy mellow times with their paddock mates. 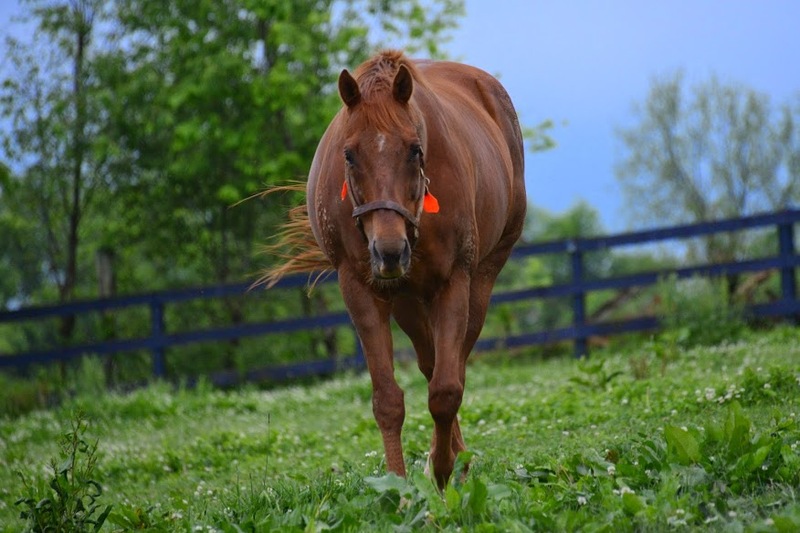 Canadian Turf Champion 2013 Forte Dei Marmi has passed the quarantine period all new residents go through and is making good friends with Starspangled Heat. 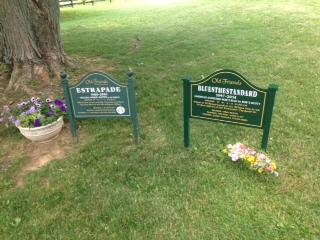 Forte Dei Marmi and Starspangled Heat. Photo by Tim Wilson. 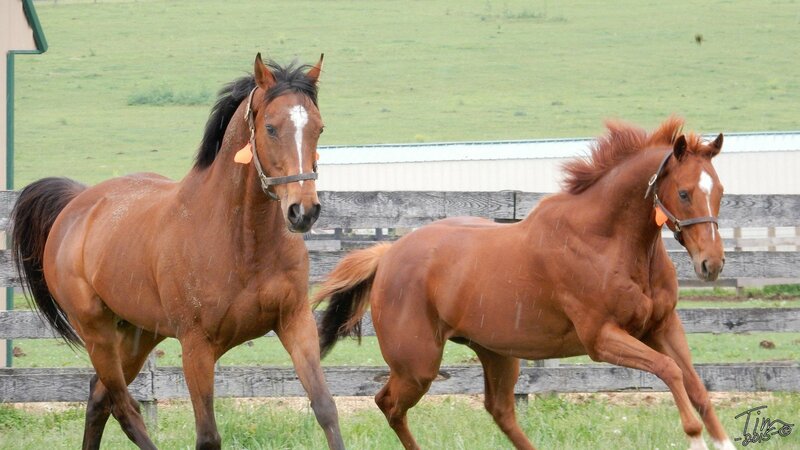 Starspangled Heat and Forte Dei Marmi. Photo by Tim. 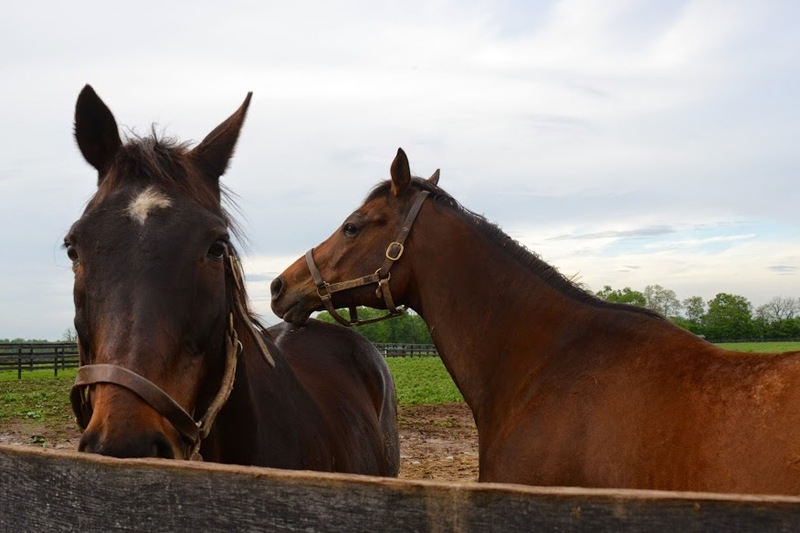 Game On Dude and Yankee Fourtune continue to be the best of buddies. 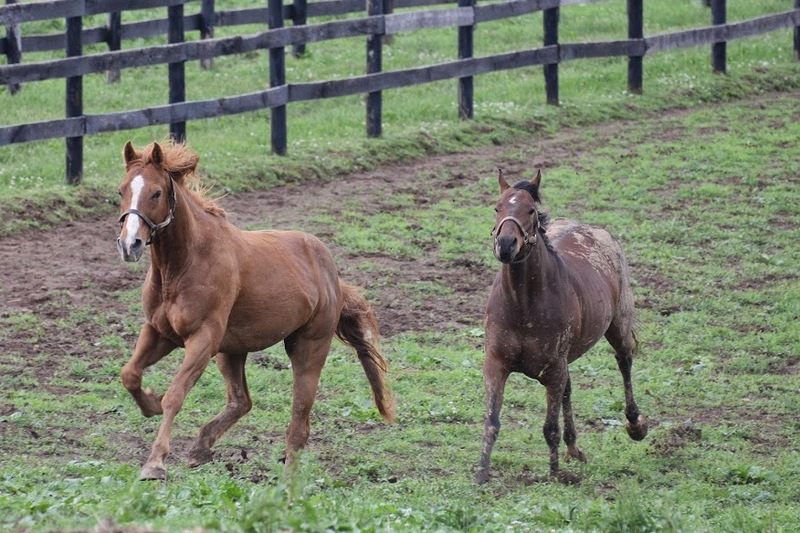 Yankee Fourtune and Game On Dude. Photo by Laura. And there’s another friendship on the farm that it’s great fun to watch grow and deepen. 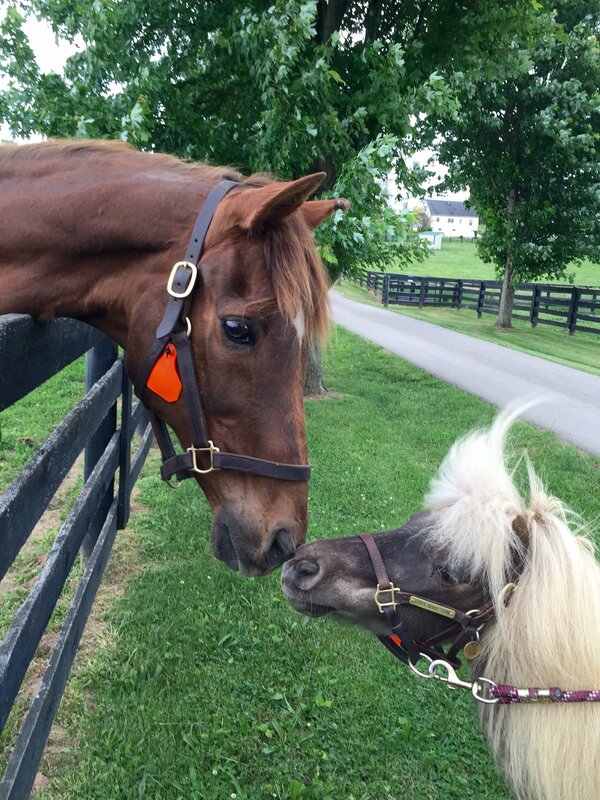 Silver Charm and Michael. Photo by Laura. 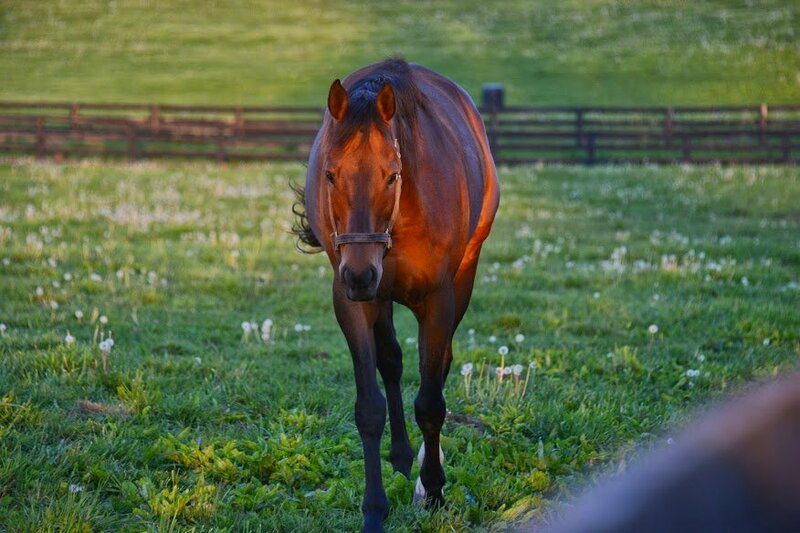 I love the long evenings after hours, when all is peaceful, and Ring stops flashing his tattoo for the day, and Rapid Redux grazes quietly beside Amazombie, and Rail Trip no longer feels he has to keep an eye out to make sure Catlaunch doesn’t get carrots he doesn’t get. 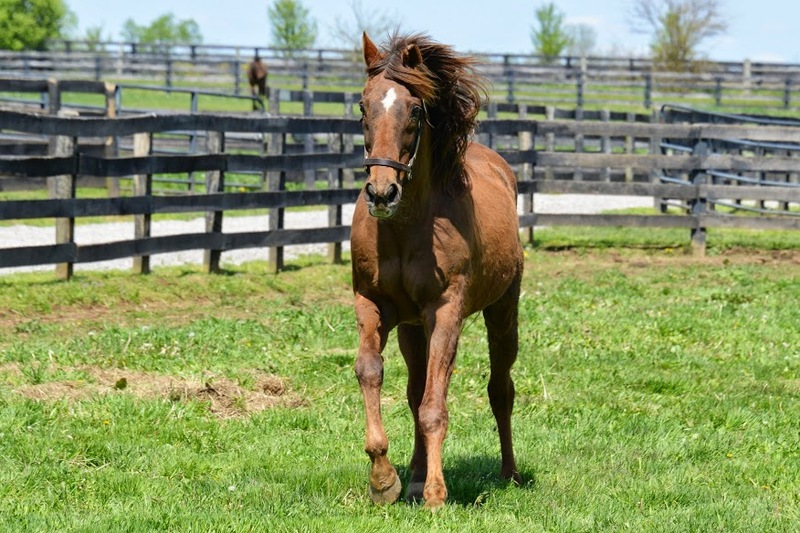 Fabulous Strike – I’ll take another carrot, anyway. Photo by Laura. 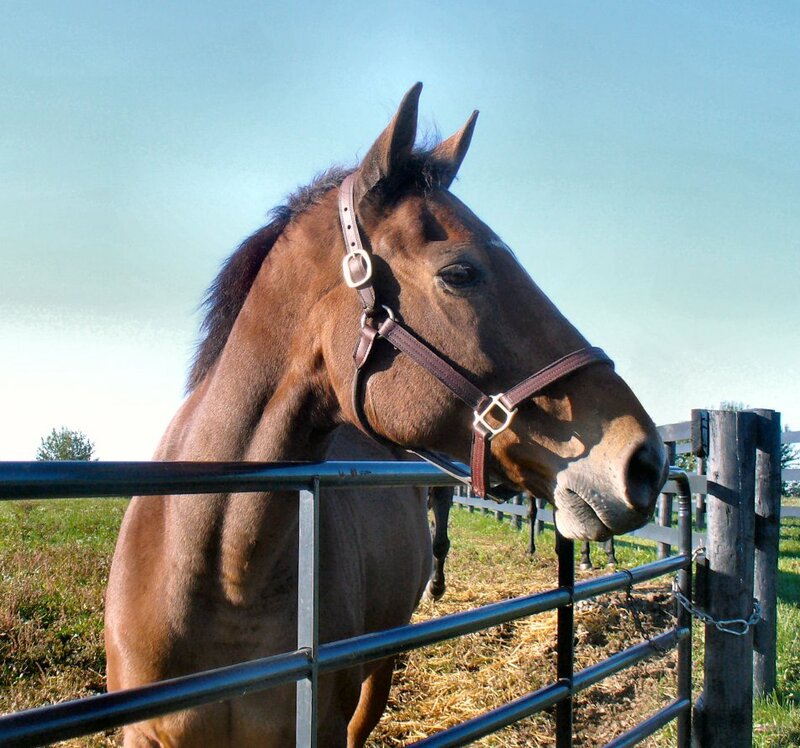 Most of all, I love watching the horses interact with each other in their paddocks and across their fences. Like the inseparable Ukiah and Easy Grades. Ukiah and Easy Grades. Photo by Laura. And newer friends Shadowcaster and Maybesomaybenot (Maybe and Bobby Sands are still best buds, but everybody loves Maybe). Shadowcaster and Maybesomaybenot enjoy an impromptu race on Preakness evening (See? We’re faster!). Photo by Laura. Two longtime friends of mine are developing a new friendship of their own, Affirmed Success and Kudos. 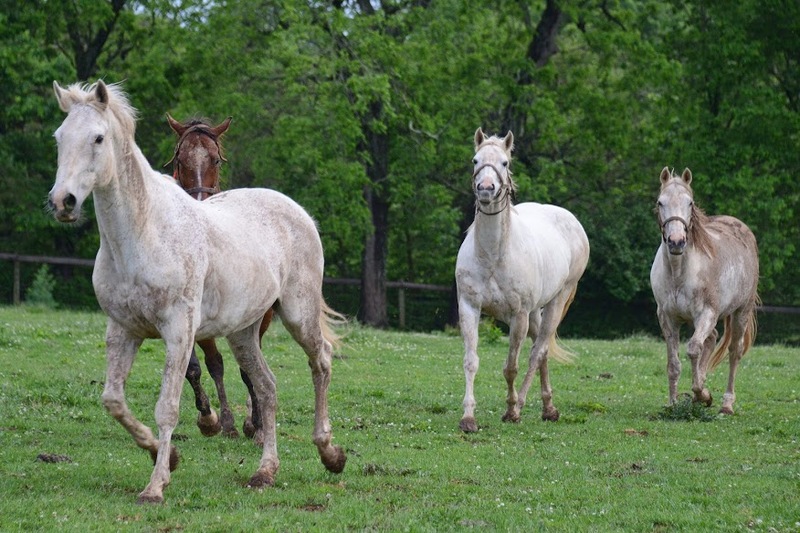 Affirmed Success, Kudos in the background (but only for a moment – these guys are well matched). Photo by Laura. And a friendship of long standing is still going strong, Canadian stars, Begg family homebreds, Victor Cooley and El Brujo. 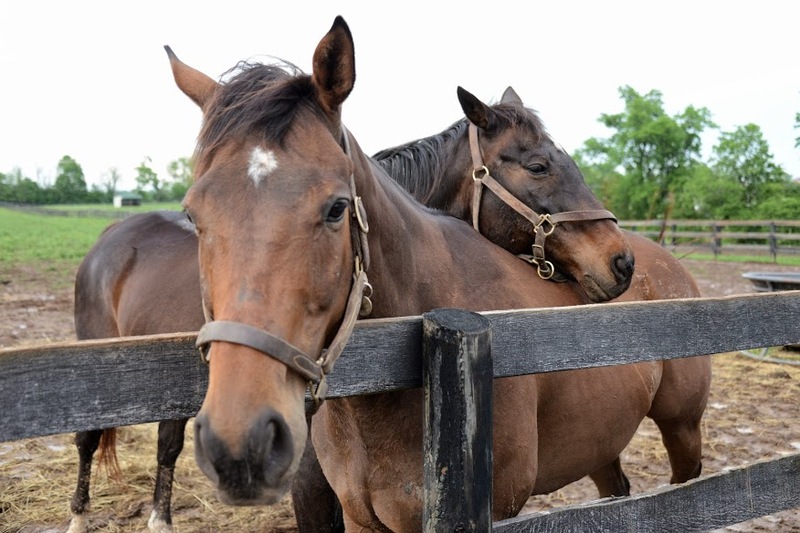 El Brujo rests his chin on his friend Victor Cooley. Photo by Laura. Victor rests his head on his friend Brujo. Photo by Laura. Last, but never, ever least, when Mixed Pleasure (via his human, John) invited some of us to celebrate his 30th birthday yesterday, Little Silver Charm came over too. He didn’t sing “Happy Birthday” with the rest of us, but he gave Mixie the best gift of all, a special birthday kiss. Mixed Pleasure gets a 30th birthday kiss! Photo by Barbara Fossum. Last Sunday was Old Friends’ annual Homecoming, and what a party we had! 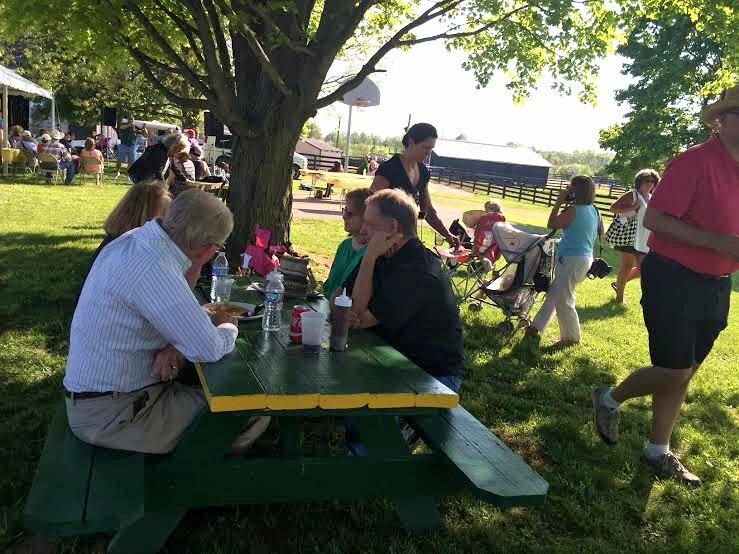 Thanks to much hard work by staff and volunteers, preparations came together, the Sunday after the Derby arrived, and the fun began. 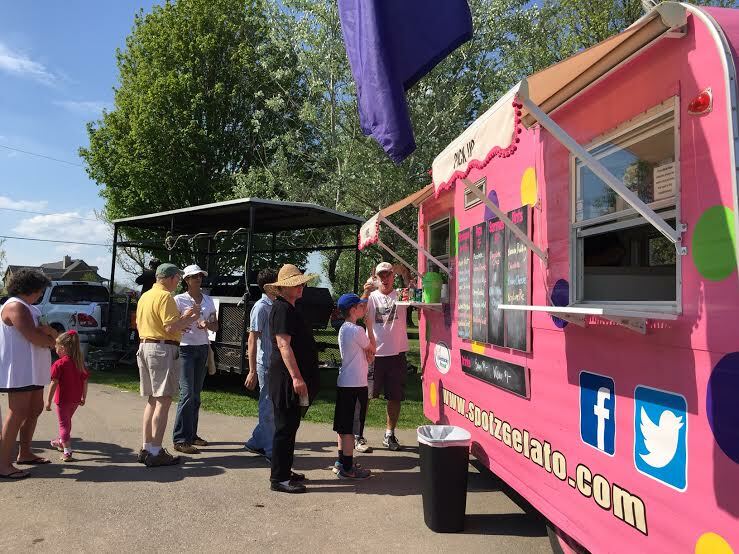 Highlights included reunions with supporters, longtime and new, enjoyed along with tasty Furlongs’ barbeque, plentiful beverages of all kinds, and delicious dessert thanks to the Spotz Gelato truck! 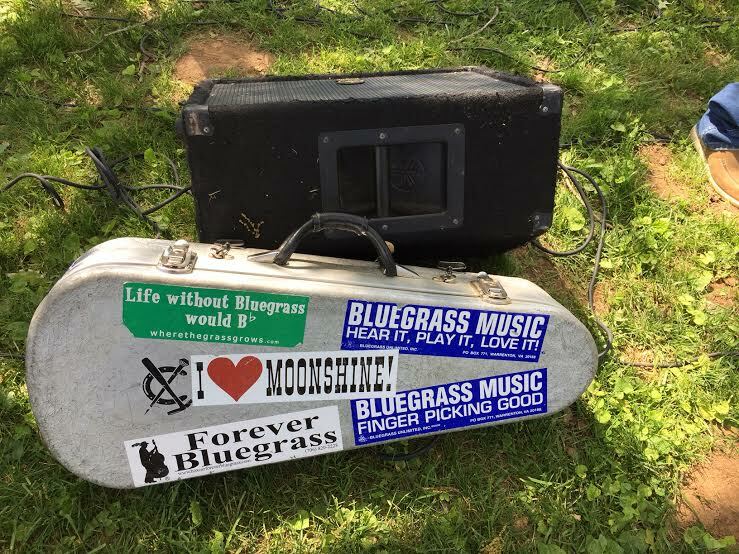 Not to mention the great bluegrass music played by Shades of Grass! 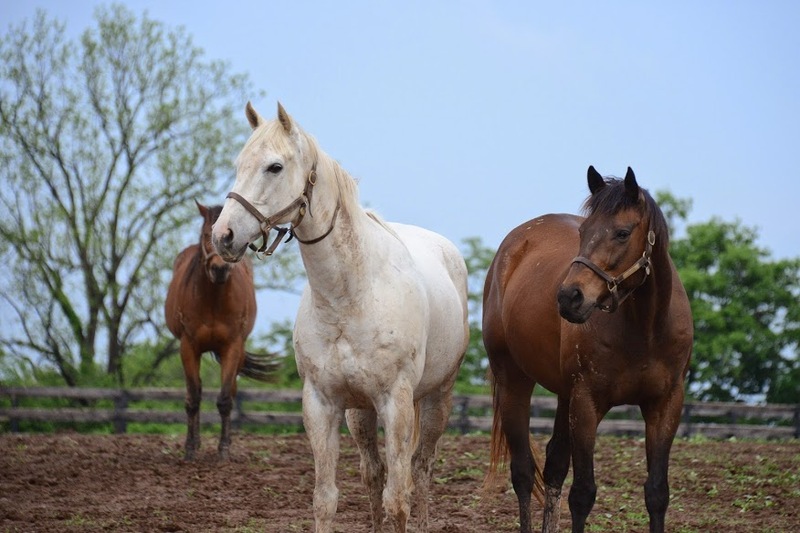 This Homecoming, Old Friends had plenty new to share and celebrate, most notably the new hosts of honor, Silver Charm, Game On Dude—and Dude’s best buddy, Yankee Fourtune, a multiple graded stakes winner in his own right and a real character. Little Silver Charm held court, of course, making sure he got a BIG share of attention and petting. Movie star Popcorn Deelites and identity-proud Special Ring (I’d be too if I were a G1 winner) partied with admirers in fine form. 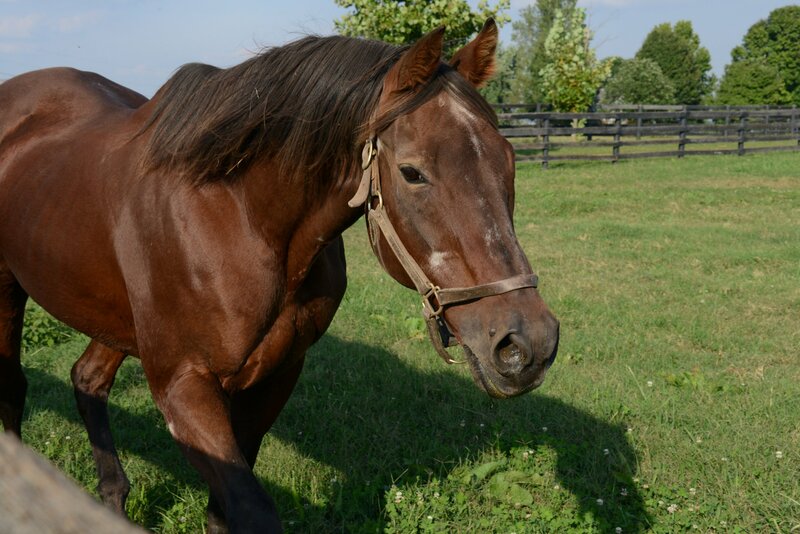 Wallenda met and greeted in the small paddock. Photo by Kelli K. Barnett. Wallenda. Photo by Laura Battles. 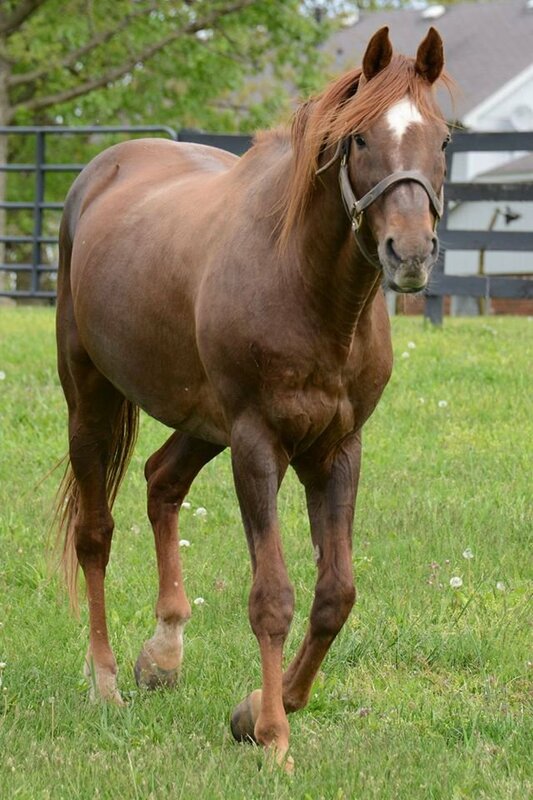 Tour guides introduced newcomers Starspangled Heat and 2013 Canadian Turf Champion, British-foaled Forte Dei Marmi, as well as Porfido, a Chilean stakes winner who earned in graded stakes in the US before falling on tougher times as an aging claimer. Also on hand to greet their friends were our many longtime residents. Golf carts made many trips up the hill to facilitate visits to Tinner, Kudos, Commentator, Affirmed Success and the mares and geldings who live in the back 40 acres of the farm, and to show off an area that was only planned as of last Homecoming, the big pasture that our Barn Manager Tim had dubbed “Area 51,” where nine geldings now enjoy each others’ society, as well as with a smaller pasture of four (Riva Way was glad to see many longtime friends) and Eldaafer’s roomy paddock with special fencing for his pet goats, Google and Yahoo. I saw Cherono and W. C. Jones cadge a few carrots. A few, and a few more. Mikethespike too. Riva Way, Massone and friends. Photo by Kelli K. Barnett. 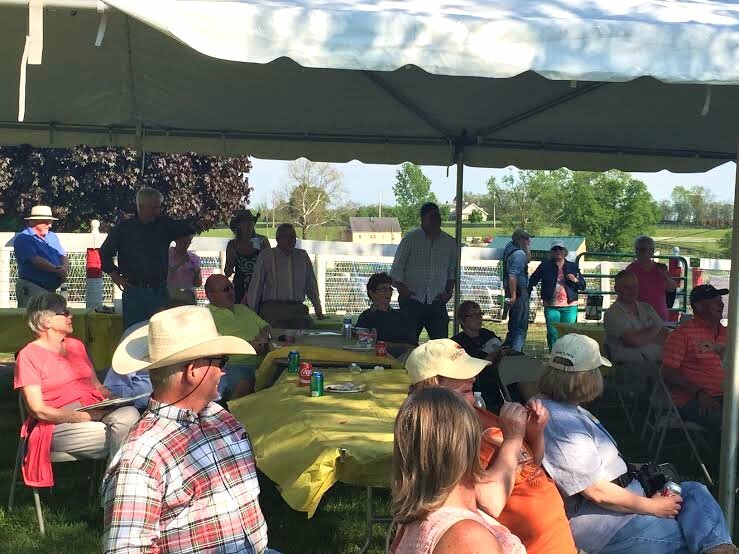 As evening drew on, people headed back for the big tent, where auctioneers Tom Sayre and Curtis Sharff once again turned their inimitable skills and wit to a lively auction that once again provided substantial support for OF’s retirees. The halter I most wish I could have afforded? Will Take Charge’s! …Or maybe Holy Bull’s! Gio Ponte’s! Eskendereya’s! Skip Away’s! Hard Spun’s! And… You get the idea. 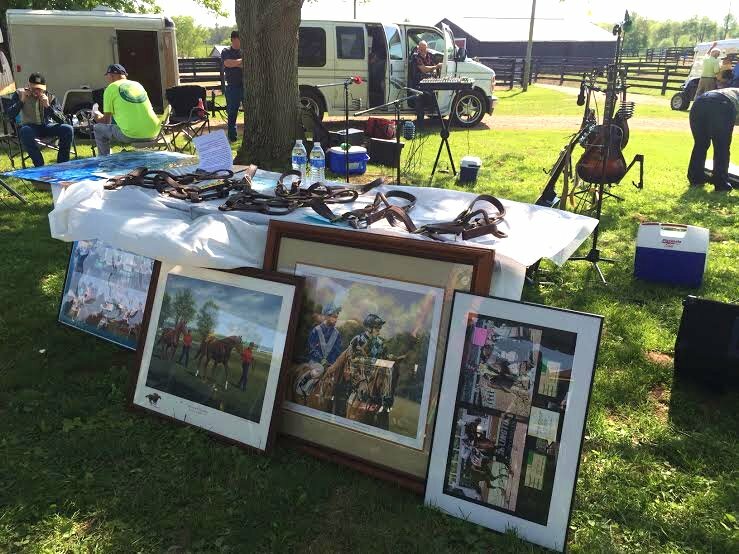 If you love horse racing, this year’s halters alone were amazing, thanks to the generosity of these horse’s farms or connections. And they were only some of the wonderful loot won by many lucky, and very kind, folks. Auction goodies. Photo by Kelli K. Barnett. Starspangled Heat celebrated the successful occasion by pirouetting a few complete turns on his toes. 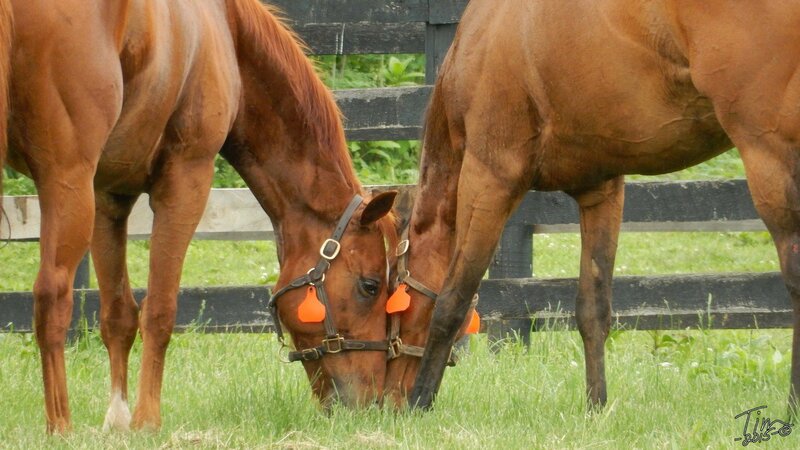 Starspangled Heat celebrates. Photos by Laura Battles. Finally, twilight deepened. People lingered over their last conversations of the evening, petted a few noses goodbye, and slowly drifted back to their cars with smiles on their faces. Staff and volunteers did the clean-up dance. Horses grazed and dozed in the quiet. Dude incandescent in the sunset. Photo by Laura Battles. Another Homecoming was over, and so soon. If you were able to celebrate with us, thank you for making it such a success. Twilight on Homecoming evening. Photo by Laura Battles. If not, this year you won’t have to wait for another Derby weekend to mix the best of horse racing with partying on behalf of Old Friends. This fall, Keeneland hosts the Breeders’ Cup. Celebrate Breeders’ Cup with OF? Oh yeah! 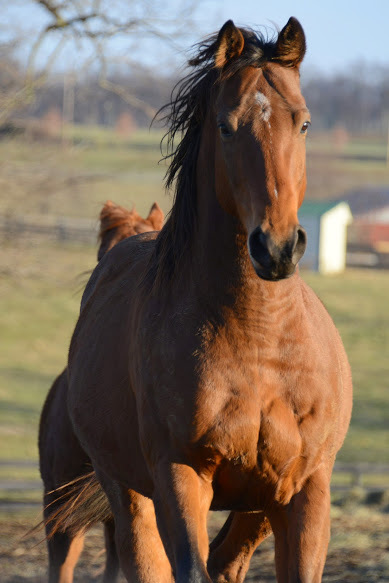 For developing information about our Kentucky festivities, keep your eye on oldfriendsequine.org. For New York fun, oldfriendsatcabincreek.com. 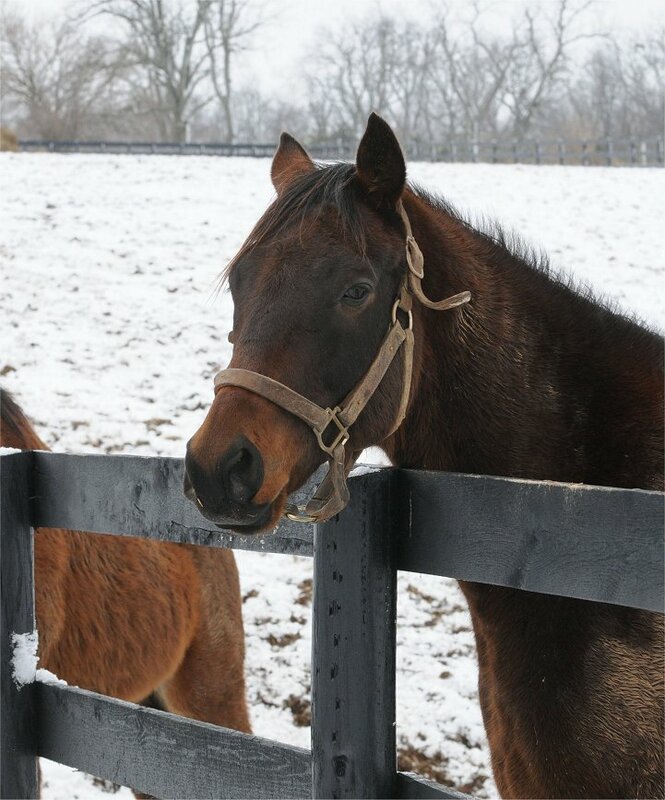 30 year old Mixed Pleasure, great-great-grandson of Seabiscuit. Photo by Laura Battles. Meanwhile, visit with us this summer at both farms. 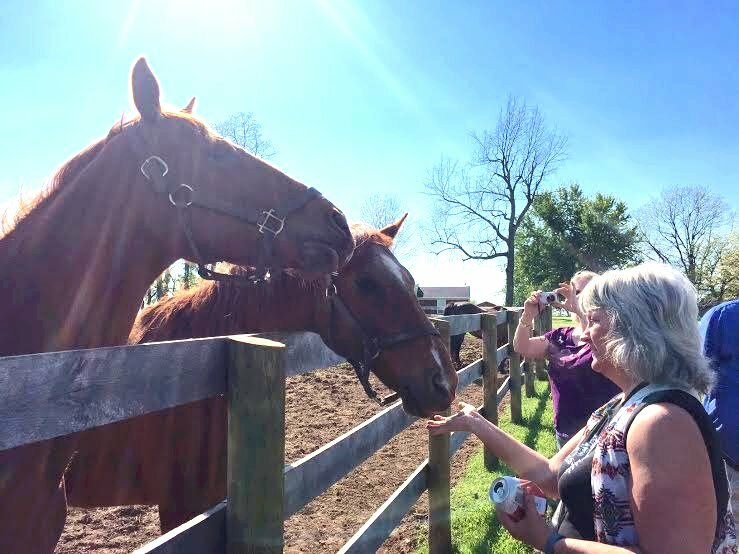 Kentucky: 3 tours a day at 10:00, 1:00 and 3:00 (for reservations call 502-863-1775). New York: 12:00 pm to 3:00 pm (call 518-698-2377 for schedule and events during the Saratoga meet).